Hi, I have a D14/4 1968. Had loads of problems with starting so I purchased and fitted a Electrux electronic ignition system. This solved the problem of a poor or no spark but still didn't want to start. 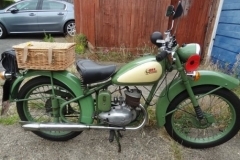 Next I rebuilt the carb, it started eventually after many attempts and ran and ticked over nicely until the revs shot up to a frightening level, managed to stop it, then it went back to poor starting. I looked through the forums and it seems as if this can be a problem with this model. 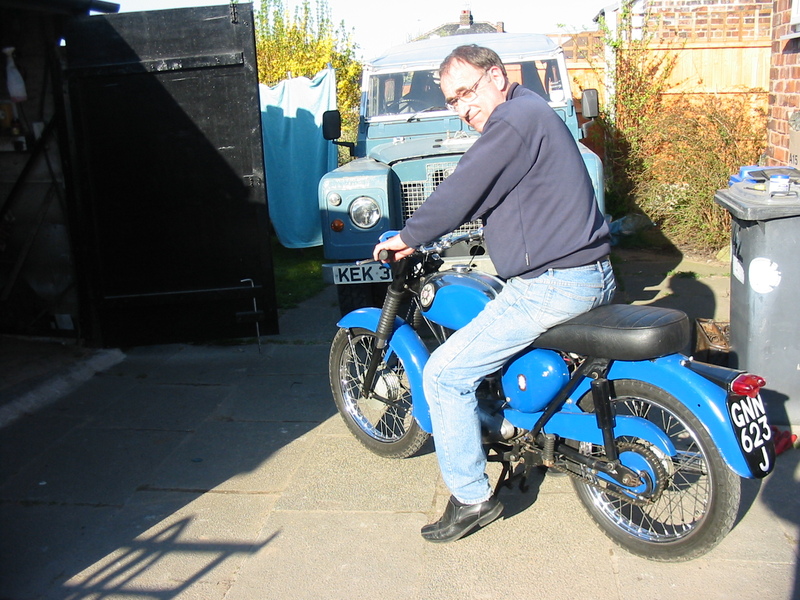 I then bought and fitted a brand new Amal carb, it wouldn't prime so took it off again, altered the float level, deep joy, it started after a few kicks, ran for a few minutes then again the revs shot up alarmingly, hit the kill switch and it eventually stopped although not straight away. There is no air leak between the carb and head. When it was revving its nuts of it did not smoke more than normal. Has anybody any idea on what could be the cause, I wondered if it could be anything to do with unburnt fuel collecting in the exhaust or even the crankcase seals but as I am somewhat of a 2 stroke virgin I may well be looking in the wrong direction. Would welcome any advice apart from introduce it to the angel grinder. Not something simple like a sticking throttle cable is it? Handlebar choke lever works the opposite way around to how most folk think it should. Maybe an air-leak somewhere. If you stopped it on the kill switch then it probably wasn`t something glowing red hot in the combustion chamber, which can be another revving-out cause, often caused by running VERY lean. Small seal behind the alternator rotor is cheap in price and relatively easy to replace using a trick, if no other problem shows up. have you drained the crankcase? How many turns do you have on the pilot screw.Mine only likes 1/4 turn or it does the same.Manual says 1and 1/4 but mine takes off if you give it more than about half a turn.Turn it right in and back out the idle to rule that out. 1/4 turn at a time once warmed up.Worth a try ,possibly has the wrong size jet. 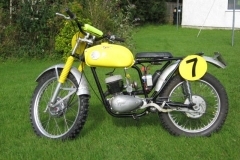 Lets hope it is something simple and easy to get at because .......... (Sorry to be the bringer of bad news but......), poor starting, over revving out of control coupled with excessive smoke can indicate a problem with the crankcase seals. Best to check everything else first but if all else fails or produces strange results then ............. its surgery !!! How long since it had new seals ? Bought a D14 off my Dad in `75, still have it. Wouldn`t start whatever I tried, went over it with a fine tooth-comb, every trick in the book, being pushed/towed, you name it. Only thing left was crank seals. 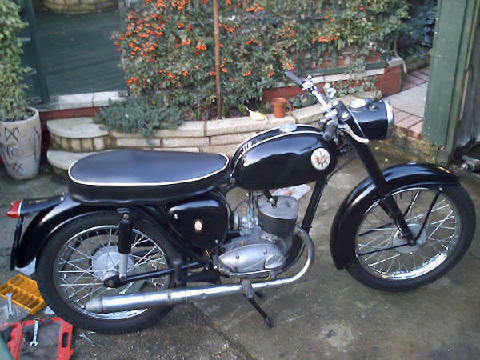 Asked Dad(ex Scott Flying Squirrel owner) if he`d renewed them, he said yes. I split the crankcases, oh no he hadn`t, they were very old, absolutely shot so replaced them. 2nd kick and away she went, ran perfectly from then on. Your D14 runs and you say it doesn`t smoke any more than normal when it`s revving out, so it`s not dragging oil in from the gearbox. Your engine would not start if the two main crankcase seals were totally shot, it needs those both sealing to obtain crankcase compression to feed upper cylinder activity once the piston has uncovered the transfer ports on its down stroke. Check your gearbox oil level because if it`s very low then it`s possible that your crank main bearings are hanging on in there with minimal oil feed, along with the small seal behind the alternator rotor being totally shot and a tired(but not shot), inner crank seal giving way to air being sucked past it and causing the high revs. ...but first of all if you can get her running again, spray penetrating oil around all joints(inlet flange, cylinder base gasket, crankcase join), to see if it`s sucked in. Or could use a small paintbrush with 3-in-1 oil containing a dye such as bright yellow turmeric powder. That would show up in the transfer ports/residual bore oil when you removed the cylinder head to check. I use fresh turmeric root daily and my fingers are always heavily stained more so than a roll-up smoker. After all that,you`ll probably find it`s something much simpler, but I`ve given you a bit to go at. The very first line in the post may give a clue- very difficult to start. 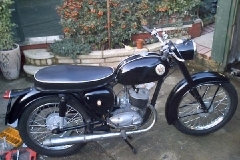 Electronic ignition was fitted when the standard set up is perfectly good to get the bike running. It probably is a case of treating symptoms and not the cause. 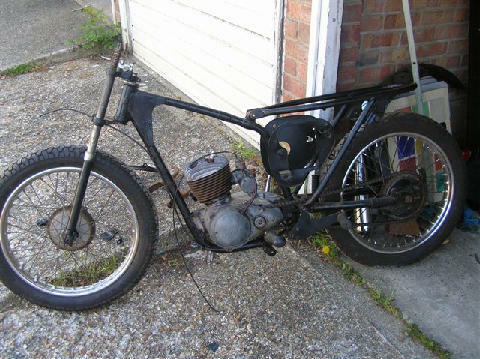 If you have a spark, fuel and compression, the bike should fire. To get the fuel into the combustion chamber you need good crankcase sealing or starting will be very difficult. If you have a good spark, try removing the spark plug and putting a small squirt of fuel mix directly into the top of the engine, replace the plug and kick it over. It should fire immediately and run for a few seconds. The engines are normally not too fussy wrt timing and exact carb set up just to get it started. It does sound though that something else is wrong with the engine. 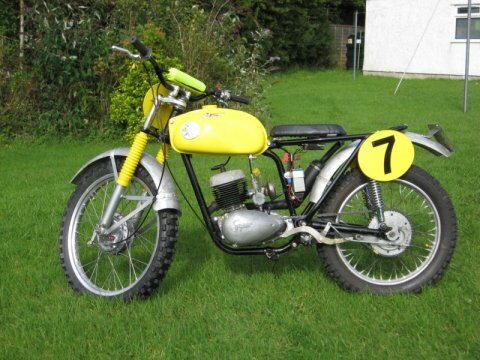 I would check the basics again; spark and fuel - clean out the carb and blow out the fuel/airways. Set the idle mixture to about 1 1/4 turns out and adjust the throttle to be open a little. If it doesn't work then to be fair the best thing is to remove the engine. It doesn't take long ( I can get mine out in 20 minutes ) and strip it. It is quite a simple engine and minimal special tools are needed for the D14. Bearings can be checked and if OK new seals can be fitted. If you are stuck, ask on here, you will get a lot of useful help! I struggled for a long time to get my B175 started, and once started to carry on running. It occasionally revved away until it died again - not unlike the D14 at the start of this thread. Mine has points ignition with a new Amal and new spark plug. 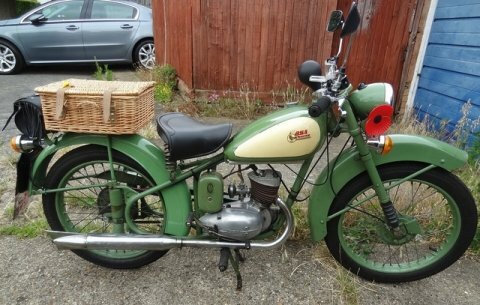 I suspected a blocked jet, but swopping for the old carb body with a removable jet didn't help. I messed around with the pilot screw, always going back to the much-quoted 1 1/2 turns starting point - no joy. I was dreading the new oil seals answer to the problem. In the end I realised that screwing the pilot adjuster in nearly all the way was helping. I've now settled on 1/4 turn out and am happy to leave it there. That got me back on the road, but the motor felt a bit strangled at 30mph or so in top. The slide fitted was 3 1/2 as per the manual. I noticed the D10 uses a 3 slide - so I fitted one I had kicking around and now the motor feels much stronger. I'm not sure if that will help answer the original question, but it supports one of the earlier responses as something worth trying. I agree with the pilot jet issue.Im going down a main jet size aswell when I get round to putting mine back together which should be very soon as the postman has delivered a few goodies today while I have been out at work.Im so excited 😁😁😁. According to the Amal website. Curious why the main jet size is 2 bigger on the b175 as to my knowledge the only difference is the cylinder head.I could be wrong though but I agree 1 1/2 turns is too much as mine was the same and it had new seals all around! There you go.Thatll do it. 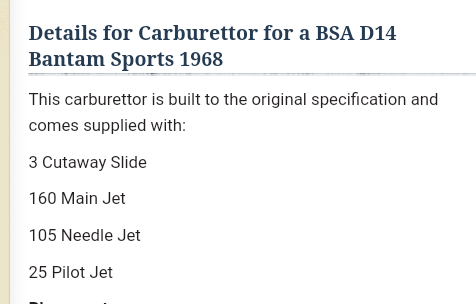 It's not the porting, it's the difference in jet mounting level between the 2-stroke (fitted to D14's) and 4-stroke type with a 2T spray tube (fitted to B175) carburettors. As you can see, the main jet sits significantly lower in the 4-stroke type set-up and as a result needs to be a bigger size due to being further away from the venturi (less suction at the jet) and probably the introduction of air bleed holes in the needle jet. Please note that you are instructed that the Main jet holder, needle jet and needle must all be fitted as a set, you cannot mix and match. That doesn’t answer why a 4 stroke carb was fitted only that it is different and requires different jets. 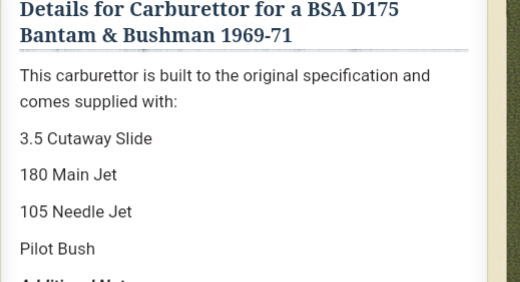 Interesting.My carb has a pressed in bush for the pilot if I remember.Possibly it's a late model d14 or the carb has been replaced?Im I'm going to check later. There is no difference in the actual carb, it's just that those 3 items are usually fitted to 4 stroke bikes. The usual explanation is that the idea was to improve mid-range performance. Personally, I don't think it made much difference. I have a B175 and a D14 and they both require a juggling act with the choke until warmed up. In addition if there is anything wrong with the idle circuit, both can be difficult if not impossible to start. Once clean and adjusted correctly, no problem. 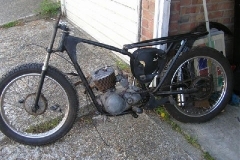 Converted my std B175 with its B175 carb with all its 4 stroke bit back to std 2 stroke config...never run better.